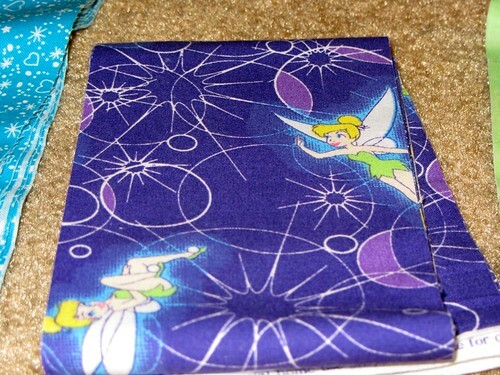 Why yes, that is Tinkerbell fabric you see. So adorable. The kit comes with all the instructions you need to put the quilt together but I think having some sewing experience would be good because some of the descriptions are a little sparse. 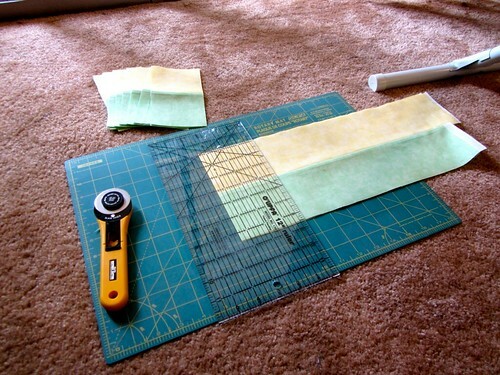 If you have a rotary cutter and mat, the project will fly by. The only blocks that require any assembly are the four-square blocks. The trick is to sew the two colors together in one long strip, then use the rotary cutter to cut the long strips into little rectangles. Once you've got your rectangles you can just flip one upside-down and sew one seam. The other blocks are solid, so no assembly at all there. 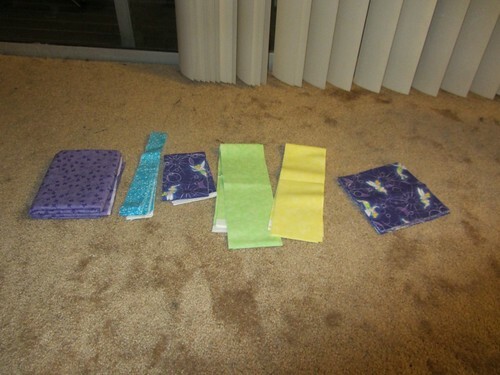 Here is what my blocks looked like all laid out before I sewed the blocks together. I wanted to make sure I didn't accidentally sew a block in upside-down. I sewed the block together by sewing all the sides of the block together to make strips then sewing the strips together one on top of the other. After the blocks are together it's a simple matter of adding the border. Seriously, from opening the package to finished quilt top took less than 4 hours. 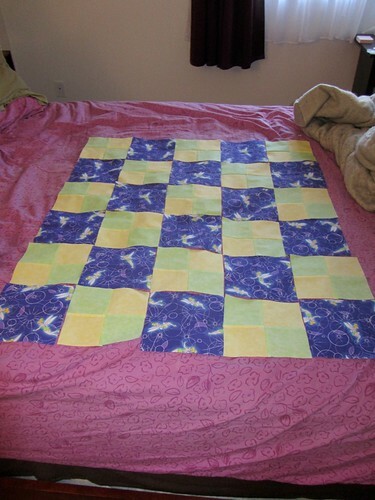 The only step that remains is to lay it out with batting and the backing fabric and do the actual quilting. I'm guessing it will be done by Sunday. Compared to knitting sewing feels like instant gratification. Do you sew too? If you came here for a knitting project and are now disappointed, check out what all the other awesome bloggers are doing over at Tami's Amis blog. Oh my gosh I absolutely love this! I will have to order a kit and make one, it's such a great way to practice quilting techniques etc. I love quilting, I should definitely dedicate more time to it. I can't wait to see what it looks like when it's quilted and finished! I sew a little but haven't for ages. I'd love to try some quiliting, you make it look so easy!! It turned out great! 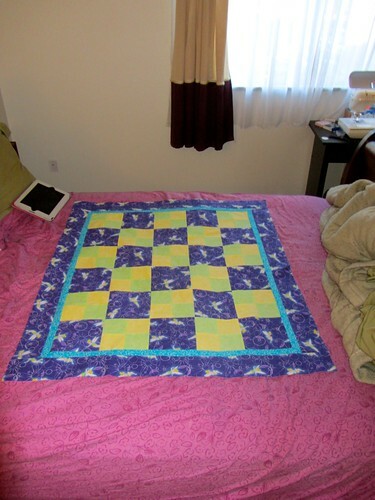 I have some sewing experience, but I've never done quilts (except a few T-shirt quilts). That sounds like a really great charity though! Maybe I'll check it out after I get a little experience. Wow, that's incredible! Remind me again why I knit?